Don was born on September 15, 1934, in Adelaide, which makes him a 78 year old Virgo, and a perfectionist, especially in his Art. Don began his Show Business career by singing the “Adeste Fideles" at Midnight Mass at St Francis Xavier’s cathedral on Christmas Eve at the age of Twelve. At Fifteen, with his big Baritone voice, Don won a talent quest at the Palais Royal Ballroom, (Adelaide) in front of an Eighteen piece Swing band; the First prize for said contest was a month’s gig with the band. Don stayed with the band as resident singer for Two years. After serving in the Australian Army for six years, including service in the Korean War, attaining the rank of Warrant Officer, and a Bachelor of Science Degree, with a Psychology major, and then as a Special Investigator for The S.A. Police Intelligence Service for Eight years, Don toured the world as an entertainer, in the U.S., London, Paris, and South East Asia. Later in life, Don went back to university to obtain a Diploma in Hotel/Motel Catering and Management from East Sydney Tech.College. Don’s career blossomed into the role of Master of Ceremonies, with a commanding voice and presence, working with such luminaries as John Denver, Robert Palmer, Harry Seccombe, and Vera Lynn, to name but a few. 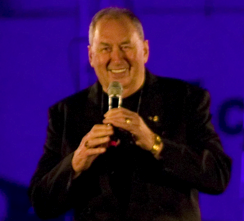 Don held the position of “Artist in Residence” as Master of Ceremonies for the “Miss Australia Quest” in Sydney for Six Years, for the Presentation Balls, and also for Fashion Parades, as well as being the Resident Master of Ceremonies for Grace Brothers Reception Centre in Sydney. Don has appeared in the T.V. Show “Sunny Side Up”, as a singer, and as an actor in the T.V.Series: Falcon Island, Kicking Around, and “Jackeroo”, and in the major film “Harlequin”, as well as major television commercials for Southside Mitsubishi, Gordonson Cycles, and an ad for Watsonia Foods, called “The Hams of W.A.” which was so successful it ran for Six years on T.V. in Perth. Don’s First love is “Live” performance, and he is still very much in demand in Perth, not only as an Emcee, but as the lead singer in the “King of Swing Big Band”, a Sixteen piece Community Swing band performing around Perth, playing for the then Premier, Dr Geoff Gallop in the new Convention Centre.. Don spent two years as the Cruise Director on the “Fairstar”, and also worked the N.S.W. Club circuit. On tour in the South Pacific, Don was the Master of Ceremonies for the “Crowning of the Queen of the South Pacific” working with Stuart Wagstaffe, and Col Joye. Kampuchean Celebrity Concert, 1980, Perth Entertainment Centre. The City of Bunbury Celebrations, 1979, Bunbury Town Hall. And Organised & Emceed the First, (1984) and the last, (2003) Jazz at the Winery, for Houghton Wines. Don was chosen by Channel Nine as the Emcee for the “Way 79” ball in Government House, Perth, to celebrate the 150th birthday of the State. Perth: Don, in conjunction with a contemporary, comedian Don Martin, Re-opened “La Riviera Theatre Restaurant” in Como, and turned it in to the place to go on Friday and Saturday nights in Perth. After a two year run, the business was sold to Peter Harries, and renamed the Knight Klub. Don and Peter continue to work together, entertaining all and sundry when the occasion arises. 1978 saw Don as the Entertainment Director of “El Caballo Blanco”, and in the role of Emcee of the Dancing Horses show. Don continues to work as an entertainer in Perth, especially as a singer of the standards made famous by Nat King Cole, Billy Exstine, Tony Bennett, and especially his hero, Frank Sinatra, and recently (2005) recorded a C.D. of Sinatra favourites, (plus others), in the Sound Studio at Channel Nine Perth. The Russell Goodrich Show, broadcast from Channel Nine, Perth, used Don’s track, “New York, New York, as the voice over for the show which was recorded in that City in 2006. As well as the “King of Swing Big Band”, Don has a trio of highly professional local musicians, all of whom have been teachers at the W.A. Academy of Performing Arts, John Perry, Piano, Barry Cox, Drums, and Murray Wilkins, Bass, which plays for various functions in Perth. This band can be, and often is augmented by musicians like Lindsay Timms, Trumpet, and Jim Cook, Saxophone, plus others. Don also works as a Duo with Musician John Perry, (Augmented Electric Piano) at various functions such as Weddings, Dinners, etc. When performing at a Wedding, Don assumes the role of personally taking care of the Bride and Groom, making their day very special. Costs for overtime can be negotiated. Don is also in demand as a Motivational Guest Speaker and Sales Psychologist.